Single or Double Storey House Plans. Which one should you Build? : iBuildNew Blog Single or Double Storey House Plans. Which one should you Build? It’s vitally important to consider everything and everyone when selecting a single or double storey house plans. For this, you will need to pick a floor plan that expertly caters to you and your family’s needs, both now and down the track. Be sure to factor in personal preference and lifestyle needs, then match them in accordance with block size and budget. There are so many other aspects of this decision-making which need to be accounted for, of course. There is no right or wrong way to go about building your ideal home, both sides have their pros and cons. Through this, we will highlight a few points to assist you in deciding between a single or double storey home plan. Perhaps the most important to consider – what’s best for you and your family. Your family require a home in which they can grow, a place that caters to everybody’s needs. If you are not at that stage yet, will you be there years from now? Will you be able to eventually downsize, and how much property value can it potentially have if you are wanting to move on? View things from a sensible, more practical approach; a single-storey plan may be more appealing due to its lower maintenance. Someone in your home may struggle walking up and down stairs because of injuries or disabilities, meaning a single-storey home is best for them. When it comes to watching the children, a single-storey certainly has its benefits – everybody will remain on the same level. Save on front and back yard space by building a double-storey home that builds upwards, instead of sprawling outwards. This option has become increasingly popular as land prices increase and block sizes get smaller. If you are willing to sacrifice outdoor space, a single-storey home is your preferable option. This generally takes up far more space. However, it does mean you will be able to build generously-sized living areas and bedrooms, and any additional rooms you see fit. While a lot has to do with location, also consider the aspect of your property. If your land has a scenic outlook, then the opportunity to build a double-storey home presents itself. Capture and showcase any views and instantly add value to your house. In this instance, building upward will assist you in capturing any natural light (and in summer, a cool breeze). A double-storey design will also provide a deluxe appearance among other homes on your street, offering an even greater appeal. The cost of both heating and cooling a single-storey home is far cheaper. It’s important to consider that the temperature of the up and downstairs will differ with inconsistent temperature zones. Separate systems will be needed for up and downstairs, creating an all new set of costly hassles. Looking at a single-storey home, heating and cooling is far more straightforward, will definitely be cheaper, and offer better circulation. While it could be spun as an advantage or disadvantage, depending on prerogative, the common perception of building upward is that you will get a home for less of your lot. This means that there may be a lot of unused space. This depends a lot on your home’s layout, but also how practical and innovative you can be. Others may perceive the extra space as an advantage, however. Having a second storey presents opportunity for versatility among unused space – think along the lines of multi-purposed areas. 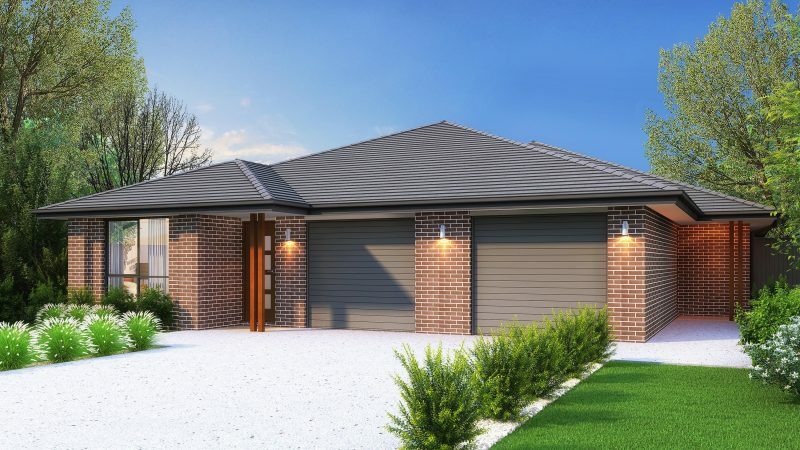 While you could make an argument for both single and double-storey design plans, the decision is going to come down to preferences between you and your family. If you’re still unsure of your next move, be it onward or upward, iBuildNew can help! For more information regarding the decision-making process in building, and greater investment opportunities Australia wide, be sure to speak with our home building experts on 1800 184 284. You can also book a call online.